The next piece of our Born this way series is by Noémi. Read the others' stories as well and find the series summary HERE. Christmas. The usual Christmas celebrations with the whole family at my grandma's place. (Oh, how I miss it...) This picture of me was taken after exchanging presents. 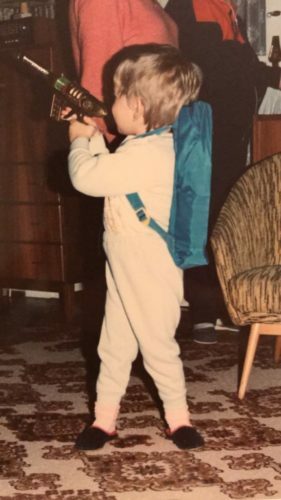 Santa brought me the Mickey Mouse backpack you can see on my back (thankfully without frills), but then I saw my brother's super cool laser gun. I needed it. Immediately. Thanks to my persistent puppy eyes, or maybe my tantrum (?) I managed to get my hands on it for a short period of time. You can see my happiness on the picture as I riddle my family with laser bullets. Maybe this gun is another motif that hints at the inevitable... and maybe so is the incident in high school before the first PE class when the teacher tried to tell me that "son, this is not the boys changing room". Back then, I didn't suspect anything. Although I wasn't really interested in boys, I didn't want to be left behind by my friends, so I successfully obtained a boyfriend. We have dated for a long time but never really got serious, since all I really felt towards him was emptiness. Then one day, I fell in love with a girl. She was my coming out to myself. I didn't waste a single minute on worrying: I felt liberated and happy. I was relieved and all I could think was "Gee, I guess this is a thing now! Butterflies in my stomach! Is this why I never felt anything for boys?! I knew that there was something missing!" Thankfully my friends reacted positively as well, but coming out to heterosexual adults still didn't come easy to me. I'd been working for eight years for the same small company where I didn't say anything. Or rather, we just didn't talk about it, as I later found out - after I already left the company - that everybody knew. In hindsight, I'm sure that if I had told them, they would have supported me. After that I started working for a major corporation and I was determined not to live a double life again. Nowadays I wear my access card on an LGBTQ lanyard and go to Pride with the company I work for. I am getting better at overcoming the need to comply and concentrating on what is good for me instead and who I really am. Because I am unique and valuable. We all are. Just let the world see you as yourself!